Does Your Dog Show Allelomimetic Behavior? I’m sure your dog shows allelomimetic behavior, but don’t worry, it’s not dangerous, except when it is, and yes, it is contagious. Confused? Keep reading. Allelomimetic behavior is doing the same as others do. Some behaviors have a strong probability of influencing others to show the same behavior. Animals keeping in constant contact with one another will inevitably develop allelomimetic behavior. Dogs show various instances of allelomimetic behavior—walking, running, sitting, lying down, getting up, sleeping, barking and howling have a strong probability of stimulating others to do the same. Social predators increase their rate of hunting success when they function in unison. One individual setting after the prey is likely to trigger the same response in the whole group. More often than we think, it is our own behavior that triggers our dog’s allelomimetic behavior (photo by SunVilla). The wolf’s howl is allelomimetic, one more behavior our domestic dogs share with their wild cousins. 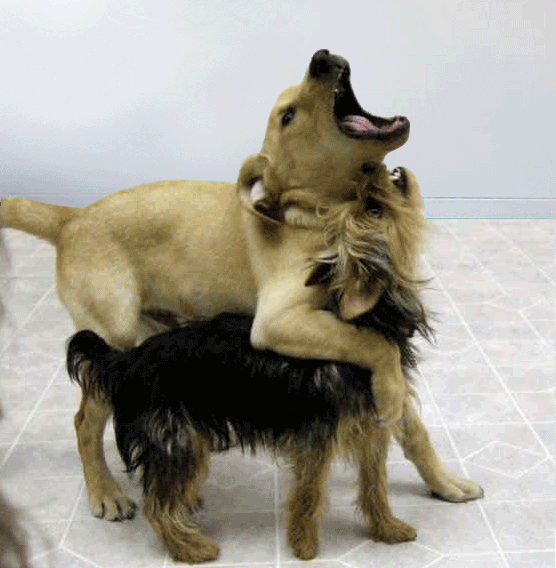 Howling together functions as social bonding. When one wolf begins howling, the whole pack usually joins in chorus, especially if a high-ranking wolf has initiated it. I bet that if you go down on your knees, turn your head up, and begin howling, (provided you are a half-decent howler) your dog will join you in chorus; then, it will attempt to demonstrate its team spirit by licking your face. Sleeping and eating are good examples of allelomimetic behavior. Dogs and cats tend to sleep and eat at the same time. Barking is also contagious. One barking dog will easily set the whole neighborhood’s dogs barking. Synchronizing behavior may be a life saver. In prey animals like deer, zebra or wildebeest, one individual has the ability to trigger the whole herd to flee. This trait is so important for self-preservation that farm animals like sheep, cows and horses still retain it. Grazing also tends to occur at the same time. 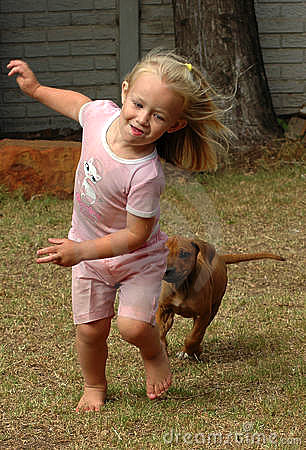 Running after a running child is more often an example of canine allelomimetic behavior than hunting or herding as many dog owners erroneously presume. 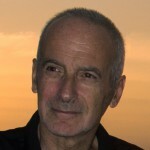 Allelomimetic behavior is not restricted to animals of the same species. Animals of different species who live together show allelomimetic behavior regularly. Dogs are good body language readers and tend to respond to certain behaviors of their owners without needing further instruction. An alerted owner triggers his dog’s alertness more often than the opposite. Puppies begin to show allelomimetic behavior at about five weeks of age. 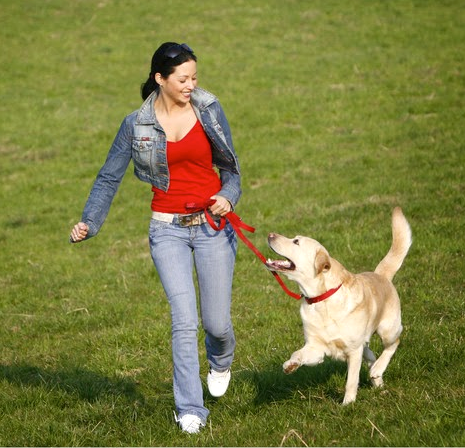 It is an intrinsic part of your dog’s behavior to adjust to the behavior of its companions. Your behavior influences your dog behavior in many more instances than you realize. 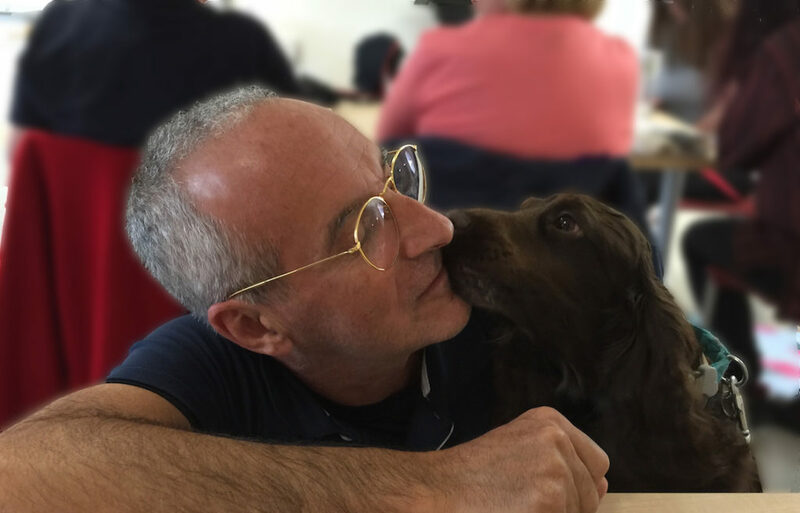 Since we have selected and bred our dogs to be highly sociable and socially promiscuous, they tend to show extended allelomimetic behavior, not only copying the behavior of their closest companions, but of others as well. Next time you walk in the park and your dog runs after running children, you can casually comment, “Typical instance of allelomimetic behavior.” Not that it will solve any problem, if there is one, but you’ll be right and I bet you will impress more than a few of your fellow park walkers. Featured image: Howling is allelomimetic behavior. Do You Want to Become a Better Dog Trainer?